Coast Guard's new motor lifeboat averted greater tragedy during an ill-fated rescue mission off Oregon's Columbia River recently, in which a Coast Guardsman and two fishermen were lost. The new prototype vessel, built by Textron Marine Systems (TMS) in New Orleans, is credited with saving the lives of four survivors of a fishing vessel which sank in 20-foot seas while under tow by another Coast Guard vessel off the coast of Oregon. The 43-foot prototype, delivered last August to the Coast Guard National Motor Lifeboat Training School in Ilwaco, Wash., had been undergoing testing in the seas off the Pacific Northwest coast as a successor to the current generation of motor lifeboats. Lt. Comdr. Daniel Neptun of the Cape Disappointment Coast Guard Station in Ilwaco, praised the $2.3 million prototype as being instrumental in preventing a greater loss of life. "It performed superbly," he said. The new aluminum-hull lifeboat, which can withstand high seas and is capable of performing a 360- degree roll and righting itself within 30 seconds (see MARITIME REPORTER/ Engineering News, September 1990, page 23), can also pitch or lunge bow first, or flip endover- end 360 degrees into a swell and still right itself within 30 seconds. The vessel can sustain speeds of 28 knots and has a range of 220 nautical miles. To protect its four-person operating crew and give them improved visibility, the motor lifeboat has an enclosed bridge. The old rescue vessels the lifeboat is replacing have open bridges, requiring the crew to be strapped into place. 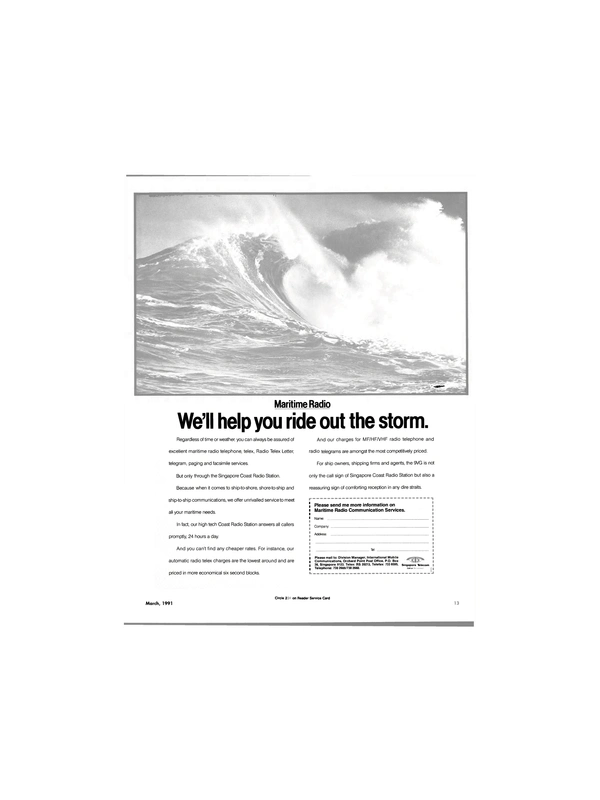 The 1988 Coast Guard contract with Textron Marine included an option for five additional motor lifeboats. Textron Marine officials expect the USCG to exercise its option to purchase the five preproduction models later this year. The contract value of the five craft is more than $4.5 million. Total production of the motor lifeboat at Textron Marine may reach 100 craft if the Coast Guard decides to replace its current rescue fleet.